She might only be 4-years-old but she certainly shouldn’t be underestimated. Her name is Ella Dobler and it’s a name that you’re going to want to remember. Her incredible dance routine has left the internet with their jaws dropped. 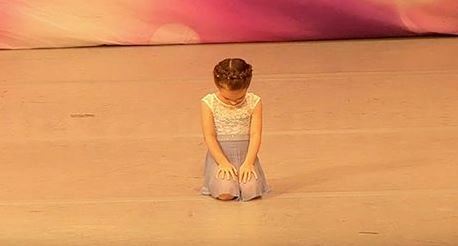 Ella is competing in the Rainbow National Dance Competition in the video on the next page. She was determined to win the first place trophy — and, of course, mom would be filming the entire moment. The talented 4-year-old has been dancing since the moment she ever heard music. Ella had a natural rhythm about her and it followed her wherever she went. She was a light of excitement no matter where she was. Ella was placed in dance competitions as a toddler and has perfected her skill more and more ever since. By just 4-years-old, it’s crazy to think that she was already competing on a national level! She’s taken home many first place prizes and was determined to make it happen again. She was going to wow the judges and the crowd with an incredible dance routine that you won’t believe is performed by such a young child! Continue to the next page for this epic performance. It’s a dance routine you won’t soon forget! très triste à regarder…aucune émotion que de la prouesse, sourire figée, démarche mécanique…pauvre enfant, délivrez-la! Shantal Nicole Je suis d’accord avec toi. Ça ressemble fort à une maman qui pousse sa fille, si on peut appeler cela une “maman”. Holy crap, Maddie Ziegler better watch out. If this little girl can stay uninjured she’ll be real big in the world of dance. Endless beauty and grace. Wow only 4 years old!! Such a little sweetie, so on point.